Parks & Recreation: Because no camel is complete without an attractive lady with a hamburger for a head. » POP! goes The Vegan. The mural shows a train – named, appropriately, “The Spirit of Pawnee” – barreling down the tracks, as a group of Native Americans throw themselves out of the way, barely escaping certain doom (at the grill of Pawnee, natch) – though at least one unlucky man is injured (as evidence by the trail of spurting blood). A crowd of abhorrently caricatured Chinese laborers looks on horror, as do several white pioneers – though they appear somewhat unconcerned by the bloodshed. Elsewhere on the mural (and not shown in the above screenshot), two Irish men accept payment in whiskey. So many stereotypes jammed into a hundred square feet! From here, we’ll skip ahead a bit, as I don’t want to spoil the entire episode for y’all. And the details are really incidental to the awesomeness, anyhow. 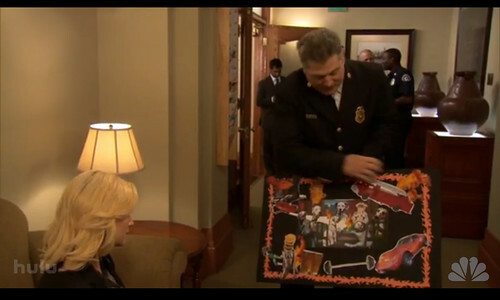 While waiting to present the Parks and Recreation department’s idea, Leslie runs into the Fire Department. Chatting with Chief Connor, Leslie beholds the department’s submission (one of many “camels” – hence the episode’s title). The Fire Department’s board is black and outlined by a rectangle of orange flames. In the center of the collage, a pack of Dalmatians sit around a poker table, playing cards. One of the “dogs” is really a kid in a dog costume. In various corners of the poster board, we see images of “manly things,” cut and pasted from magazines: A toy fire truck. A red race car. A football player caught in mid-leap. Barbells. Beer. And a thin, white, large-breasted, bikini-clad clad woman – crouched down on her knees, as if to fellate a John (or her surfer-boy boyfriend) – with a triple-stack hamburger for a head. This scene starts at 18:40, but here’s a transcript for those who can’t view the video. Leslie Knope: Chief Connor. Whaddya got there? this is an attractive lady with a hamburger for a head…just some stuff we like, you know. If you can, you really must watch the video, because it’s hard to capture the essence of the exchange in writing. 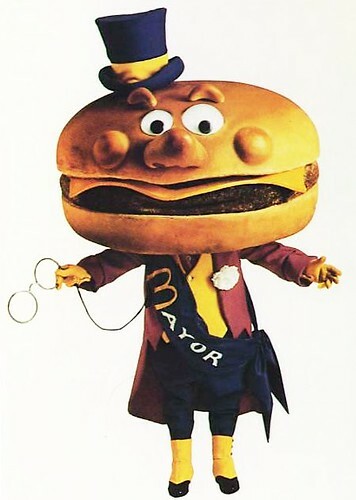 Chief Connor’s delivery is just so casual and banal, as if a “an attractive lady with a hamburger for a head” is the most natural thing in the world – and not entirely speciesist, misogynistic and serial-killer depraved. Hot chicks with meat parts – just as wholesome as beer and Hot Wheels. Shane and I guffawed at this exchange for not a few minutes. The sad thing is – though Parks & Rec is satirical – my immediate thought was that what I had just witnessed was not, in point o’ facts, beyond the realm of reality. That is to say, I could actually picture this happening. I could envision a dude submitting this as a mural idea. Seriously. In a professional setting. Without a hint of humor or irony. For reals. I knew Mrs. McCheese and I were not strangers. I wonder if any of the writers are familiar with The Sexual Politics of Meat? By the by, last Thursday’s episode is called “The Hunting Trip.” No doubt we’ll have more to discuss when I get around to watching it.